Sometimes, all the signs are there, but we just don’t want to read them. Dr. Michael Hfuhruhurr gave us a perfect example. A widower played by Steve Martin in The Man With Two Brains, he stands before his wife’s portrait on finding his perfect second wife. If marrying her is not the right thing, he tells the picture, just give me a sign. Any sign. He stands there as the picture spins round, the wall behind cracks and a spectral voice wails “No, no, no!” After a while it subsides. “Just any sign,” he says, “I’ll be on the lookout for it;” and he takes the portrait and puts it in a cupboard somewhere. The signs are there: we can see them; we can hear them. But the payoff, if we ignore them, is just too great. Which brings me to the story of the incredible exploding factory. Rivers can be used for good things; and not so good things. The River Weaver, which runs through Cheshire and the town of Northwich, attracted an industrialist and a chemist in 1873 to build a chemical plant. By 1933, this was known as the ICI works. There’s this very sensitive, extremely explosive yellow gas. It’s called diazomethane. One day, in the dying days of the 19th century, a gentleman names Hans Von Pechmann was busy heating it in a test tube when he realised there was white waxy stuff at the bottom. He did not recognise its uses: it took two Englishmen at the Northwich ICI plant to realise this stuff, combined with benzaldehyde,could produce a substance which could cover submarine cables better than any existing compound. Eric Fawcett and Reginald Gibson were pleased with their invention. Someone made a little polythene pill-box and presented it to one of the chemists. The insulating properties of polythene were considerable: the military rendered the whole business top secret and everything went quiet during World War Two: but at the end of the war ICI licensed Bakelite to start creating plastics using polythene , and the rest is household history. Submarine manufacturers ordered 100 tonnes of polythene, back in those experimental days, making it possible for a production plant to be opened on the day Hitler invaded Poland. But, the story goes, there proved to be a problem. The highly explosive nature of the production process meant that the factory must have a regular two-week shut down every two or three years, or it would explode. They had a warning system: but one year the warning came too late and the factory exploded. But the seductive qualities of the material being produced were too great. Explosion was a small price to pay for the money polythene was bringing in. And so, it is claimed, ICI designed a prefabricated building, built over a concrete skeleton, which was specifically designed to explode with the minimum of fuss. It was reputedly allowed to explode, now and then, until an explosion-proof building was built in 1978. Verifying this story is fiendishly difficult. It’s not something the tourist board or the local councils like to tell you. But talk to the locals and their recollections are there. A sign. Just any sign. Reversing the process of creating polythene is a thousand-year business. It is fortunate the globe has such a vast time scale, less fortunate that we live only a century at best. We can choose to ignore even the most blatant signs, if there’s something in it for us. But our happiness – and our future -depends on turning to look them full in the face. With thanks to John May’s Book of Curious Facts (Collins and Brown, 1993) for a cracking lead. And thanks to RamblesWithACamera for the stunning mosaic picture! Posted in Quirks of HistoryTagged explosion, history, ICI, plastics, polytheneBookmark the permalink. athe big industries are only ALLOWED to kill a certain number of people a year, beyond that official investigations begin. And those numbers differ between countries. Some lives are cheaper to the corporate mind than others. I wonder how we will ever tidy up behind ourselves? I don’t think harm to people was an issue, Sidey: this would have been a highly controlled business if it did go on. Tidying up: how, indeed? Better take me out again – re-reading the post, I realised you are talking about the Northwich plant, which I didn’t know existed. 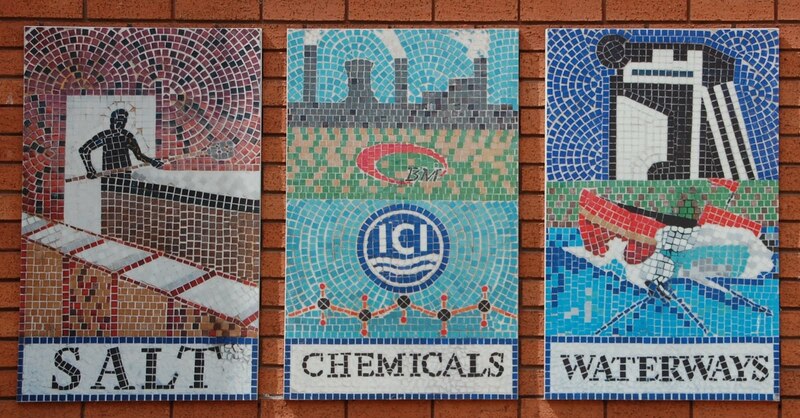 The River Weaver runs through Runcorn, where I grew up, and there is an ICI plant there also, hence my confusion. BTW, I liked being a primary source, however briefly. If you ever write about Runcorn 1972-1982, I’m your man! That’s quite a project, Andra! And I cannot help but notice it’s being explained by one of my favourite physicist dudes, Brian Cox…. creating a star on earth must be a cue for lots of experimental explosions! You’ve got that right, TT 🙂 At least my job doesn’t periodically explode! I hear what you are saying about signs Kate. Sometimes we don’t notice them because they are too good to be true… sometimes we choose not to notice them for …other reasons. What about the workers during thos periodic explosions?! How strange. I can find no mention of how the workers were safeguarded, BB. It is a strange business. Why is MAN convinced that he is the most intelligent animal on the planet . . . and how has he persuaded himself that he is at the top of the food chain?? 😀 …and yet the same mistakes get committed over and over again, don’t they, Nancy. I seem to remember dynamite has a rather chequered history too…and our Royal Gunpowder Mills were constructed to minimise accidents, yet still they happened.. When I think of how many signs we’re ignoring now–it’s scary. Yes; let us hope our globe is big and resourceful enough to cope with the wreckage of the wrong decisions, Kathy. Kate, you never cease to amaze me with your writing. A sign of a book one day? Yes! 😀 Penny, thank you. I’d be happy with a column somewhere out in the real world…once a journalist…however, we are both lucky to live in a time when one can self publish a post a day and hear back from friends. It’s a nice existence. An exploding factory drives all other thoughts out of my mind, even when I know I ought to be wise, and think about the signs. Graphic image, isn’t it, Banno? The idea of tolerating the effects of a highly unstable marriage of chemicals to create something which made money: the mind boggles. Pingback: On the right path? | Me! Me! Me me me! I’m fairly certain I’ve ignored signs of scheduled explosions… I hope to remain slightly more vigilant from here on out.